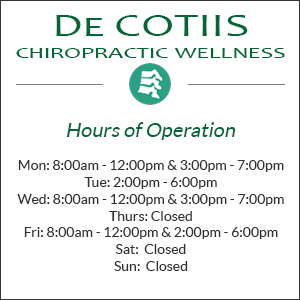 De Cotiis Chiropractic Wellness offers our patient forms online so they can be completed in the convenience of your own home or office. Download the necessary forms, print them out and fill in the required information. Bring them with you on your first appointment. Please download and print any necessary forms from the list below and fill them out prior to your first visit. Take your time and answer all questions thoroughly. The more information you provide the better we are able to understand your condition(s) and better serve you.